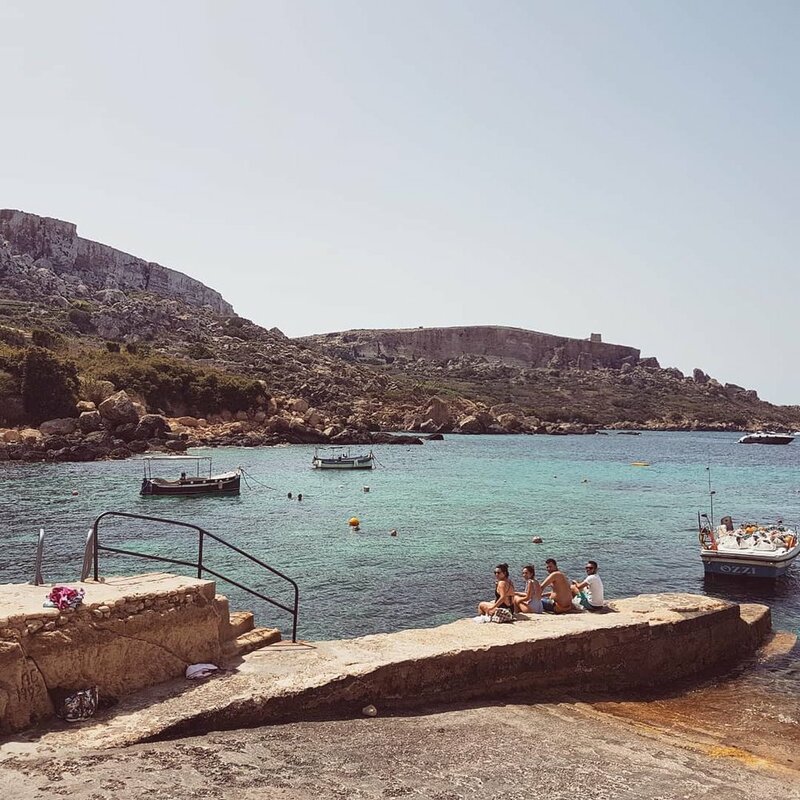 If you’re visiting Gozo, chances are that you may most probably end up either at Ramla Bay, Marsalforn or Xlendi for your summer beach fix. These are striking seaside locations that are very popular amongst both locals and tourists alike. However, if your idea of a great beach day also includes some tranquility and calmness in addition to crystal clear waters, luckily Gozo is absolutely brimming with equally remarkable beach options and here are some of them. Once you enter Nadur village from Victoria, watch out for the road signs to navigate through the winding streets of the village. As you start to leave the village behind and the houses become slowly dispersed, you will be eventually welcomed by a very scenic road paved through the countryside. This road leads you down to the pretty little bay where the water is truly inviting, clean and ever so refreshing. The views which Dahlet Qorrot affords are truly remarkable, and there are plenty of places scattered around where sunbathers can enjoy basking underneath the Mediterranean sun. If you're fond of walking you will be pleased to learn that Dahlet Qorrot also offers hiking opportunities. A railed pathway on the right side of the bay leads to a very picturesque hike along Dahlet Qorrot's grand coastline, giving way to the honey-coloured, rugged terrain on one side, and the vast, deep blue sea on the other. Perfect! As with most of the lesser known beaches in Gozo, one has to descend a flight of stairs to reach this beautiful little inlet.Il-Kantra beach perhaps offers the true definition of a secluded bay, as it is totally surrounded by sheer cliffs, with the railed flight of stairs acting as the only access point towards it. The beauty of this inlet lies in its simplicity; there is only a small concrete area on the side ideal for sunbathing and a ladder from which you can slowly immerse yourself into the invigorating sea. This enchanting beach is actually separated from il-Kantra beach by a pleasant 20 minute walk along the rugged coastline with dramatic panoramas of the sparkling Mediterranean sea - an ideal location to snap some pictures. Mgarr ix-Xini's beauty also attracted two of Hollywood's biggest names; Angelina Jolie and Brad Pitt. They flew to the island with an entire entourage to film their movie 'By The Sea' back in 2015, and it was closed off to the public for the whole summer. The filming was covered very extensively in the foreign media and continued to put the idyllic island of Gozo on the map, helping it emerge further from the shadow of sister island Malta. As you start nearing Mgarr ix-Xini, you will be immediately captivated by its charming beauty. The inlet is embraced by the cliffs on either side and The Knight's watch tower built in 1661 still stands proudly guarding over the entrance to the inlet. Going down stone steps you will notice a restaurant just above the small pebbled beach and some water sport activities that you can take up if you want to have a break from suntbathing. If you are looking for an off-the-beaten-track experience, Wied il-Ghasri should definitely be on the top of your list. A lovely walk through the countryside leads to a staircase cut out from the rock down to this hidden valley. It is a belter of a spot for a lovely afternoon salt water dip and the bay is absolutely peppered with pebbles of all sorts and sizes. The sea water is super clear and invigorating, especially that located beneath the cliffs. Wied il-Ghasri offers a certain calmness about it which is not synonymous with many other beaches in Gozo. It is rarely populated and the spot is completely unspoilt, Most visitors tend to stick around for only an hour or two since the area is void of beach facilities. Newer Post8 things you should know before visiting Gozo!